The greatest education is to know Christ! “ These things says He who is holy, He who is true, ‘He who has the key of David, He who opens and no one shuts, and shuts and no one opens”: “ I know your works. See, I have set before you an open door, and no one can shut it; for you have a little strength, have kept My word, and have not denied My name. Jesus has the Key of David! He will shut the doors of sickness and open the door of abundance and supplies in my life!!! My Jesus make poor people rich! Rich does not mean it is all for ourselves but about ministries to others!! There r many poor people who has plenty of money. Prosperity is in every area of our life! Jesus stands at the door and knock. We have to open for Him. When He comes in, abundant life comes in! Jesus is never among the sick and they are not healed! Jesus earthly parents were poor. The rich will bring lambs but the poor will bring doves. His parents brought doves. The wise men came from afar and baby Jesus was more than 1 years plus. These wise men brought to them riches because Jesus was in the house! As a baby, Jesus sponsored his parents! He made them rich! Whenever Jesus took something, He will never take to give back something greater!! U cannot outgive Jesus!! When u sow in the ministry, Jesus will bless much more!! Jesus is the Root and Offspring of David! In an instant, Jesus can open doors that have not been opened before. 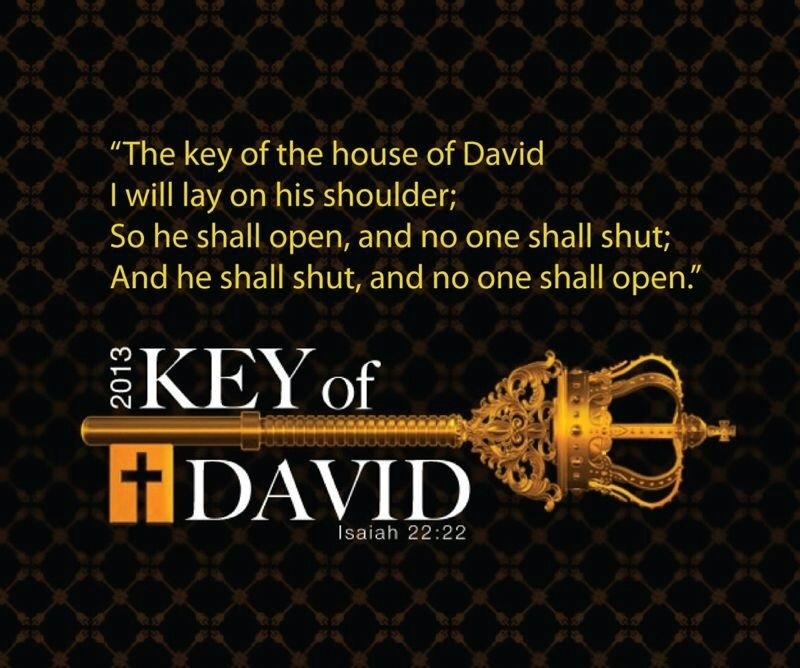 Key of David because there is something significance about him. He worshiped! The Lord is my Shepherd, I shall not lack! He makes me besides still water! My cups run over! – more than enough! midnight hour in your life? Sing praises to Jesus!! But at midnight Paul and Silas were praying and singing hymns to God, and the prisoners were listening to them. Suddenly there was a great earthquake, so that the foundations of the prison were shaken; and immediately all the doors were opened and everyone’s chains were loosed. Paul and Silas were in their midnight hours of their lives, they were singing praises and every prison doors were opened!! The house of David is characterised by worship! Everything flourishes around them! Everytime the house of David is filled with praise!! This is during the new covenant! He will rebuild the tabernacle of David. Moreover King Hezekiah and the leaders commanded the Levites to sing praise to the Lord with the words of David and of Asaph the seer. So they sang praises with gladness, and they bowed their heads and worshiped. Sing the words of David and there is a special anointing! “And I will pour on the house of David and on the inhabitants of Jerusalem the Spirit of grace and supplication; then they will look on Me whom they pierced. Yes, they will mourn for Him as one mourns for his only son, and grieve for Him as one grieves for a firstborn. It is unmerited undeserved favour!! Dont be busy trying to earn favour. Grace is defined as unearned favour! Charismatic – means full of favour! When u have experience unmerited favour, u get back favour!! Makes us full of thanksgiving!! Thanksgiving – praise! Praise Jesus!! Dont be one of those common people. The opposite of holy is common! It is common n easy to complain. But it is uncommon to praise! So lets be uncommon!! Find good things to praise! Learn to praise God more! The ark of the covenant – symbolised the presence of God! David brought the Ark back! David brought a new kind of worship! It is direct connection to God-worship!! All are worshipping God! As they worship God, they are transformed and transforming!! Worship freely!! Direct interaction with God’s presence!! The 1st sign a person receive wisdom is that they start to look for God’s presence. They treasure Jesus’ presence! We have a heart for wisdom! We honour king, but when we see the King of kings we are transformed n never the same! Study and meditate on Psalm 23!!! This is the key to your lack!! Meditate!!! Meditate! Do it because it is the key of David! Praise Jesus always! Be like David. At 17, he was conscious of the Lord. He has the sword of the Spirit in his mouth! Young David began to sing praises to his sheep. Praise cause his enemies to fall at his feet!! PRAISE!! Praise is the key!!! Love the Lord and worship Him! This was what David did. King Saul was jealous of David and David fled from Saul. Everytime Saul cornered David and David would praise God and he would be delivered! David was depressed and he sang praises that God is the Lifter of his head!! God will turn the situation around for me and put in the key of David! We are worshipping the One who goes into our past and our future! God is outside time. David was sad when King Saul was after him and he was on the run. We fell from our high ground because we forgot to trust God. Feed and drink and not taste! God leads us besides still water. Drink! David departed to the cave of Adullam. And everyone who was in distress, everyone who was in debt, and everyone who was discontented gathered to him. Stress is number 1 killer. Jesus is the greatest Son of David. When we come to Jesus, we will be changed! Look to the Lord! Magnify the Lord with us! Make God big big in our consciousness! David has fears but the Lord delivered him from ALL his fear!!! Whatever fear we have, put the key of David and God opened the DOOR to freedom from all our fears!! When we look to the Lord, our faces SHINES!! God will deliver me out of ALL my troubles!!! The word Fear the Lord – is Worship the Lord! Worship the Lord my God and Him only!!! Taste and see that the Lord is good!!! There is no lack to those who fear (worship) Him!! See GOOD! See many many good days!!!! Love life and see good dayssssss!!!!! Love many good days in 2013!!! Have a song in our heart! I will see many good dayssss in 2013!!!! The 3D army became mighty men! These are the names of the mighty men whom David had:Josheb- Basshebeth the Tachmonite, chief among the captains. He was called Adino the Eznite, because he had killed eight hundred men at one time. And after him was Eleazar the son of Dodo, the Ahohite, one of the three mighty men with David when they defied the Philistines who were gathered there for battle, and the men of Israel had retreated. He arose and attacked the Philistines until his hand was weary, and his hand stuck to the sword. The Lord brought about a great victory that day; and the people returned after him only to plunder. And after him was Shammah the son of Agee the Hararite. The Philistines had gathered together into a troop where there was a piece of ground full of lentils. So the people fled from the Philistines. But he stationed himself in the middle of the field, defended it, and killed the Philistines. So the Lord brought about a great victory. They transformed !! From complaining and depressed to mighty men!! Don’t back down, stand our ground ! Jesus died to give me the victory!! Something happen in the cave when David met the 3D army. They look to the Lord and worship the Lord and be conscious of Jesus and not themselves! God wants to set many people free from fear right now!! The Lord knows n He cares and wants to set us free!